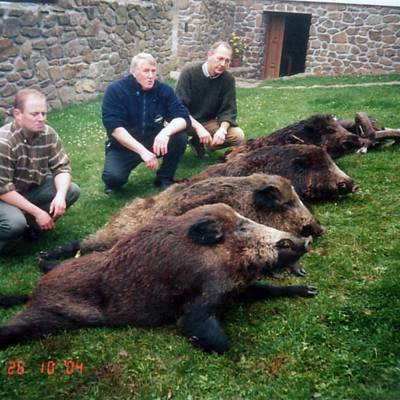 We offer Wild boar hunt in Southern part of Czech Republic. Estimated trophy size is calculated by hunting guide. The trophy is weighted 24 hours after the boiling, together with big skull and upper jaw. 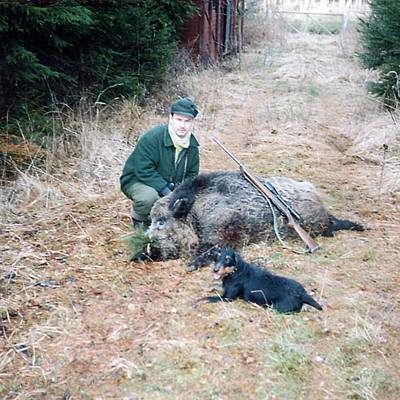 We recommended 3-5 hunting days for the wild boar. It is possible to provide driven hunt in a small group, if the snow is on the land and we can see wild boar´s trail in and located their position. Hunting time: whole year Best hunting time: always about a week before the full moon Rutting season: Nov 1. - Jan 31. Additional hunting days can be added for €175 per day including accommodation with full board, hunting guide, transfer in the territory. 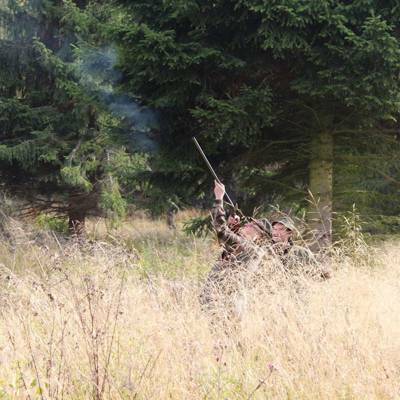 For hunting in Czech Republic is needed : Czech hunting licence, Insurance, Hunting Invitation. That is the reason why we need to send with your booking list copies of following documents: Hunting licence from your country, and passport or personal paper. The next step is to fill the booking list with your name, date of birth, passport number or personal number. When we have all necessary documents, our firm submit a Czech hunting licence for you. Please inquire for available days. The words highest score Mouflon trophy comes from this estate, which is also a proud owner of other dominant games bred, such as Red Deer, alongside Fallow Deer, and Boar. Every year a selection of outstanding point value game is shot. 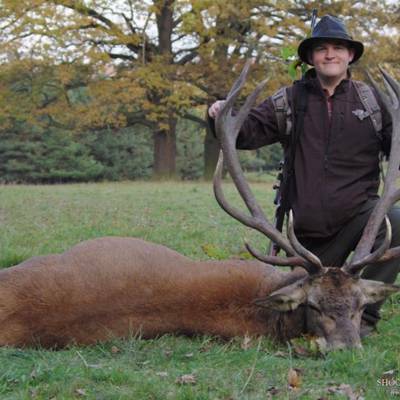 The following trophies are not exceptions: Mouflon 240 CIC Red Deer 220 CIC Fallow Deer 190 CIC. 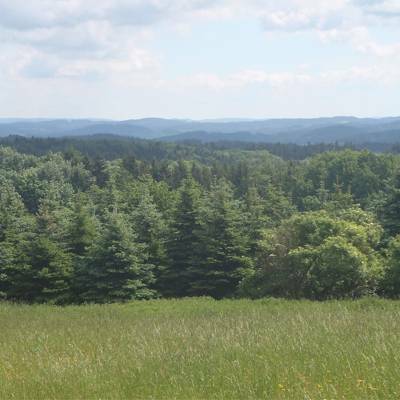 We offer 5 days/3 hunting days (1 arrival and 1 departure days) driven hunt without trophy in the bohemian forests at the altitude ca.400-800 m. Wildlife that is available to bag: Wild boar - tusker, pig, piglet, sow - closed season Red deer - hind, calf Mouflon - ewe, lamb Sika deer in limited number - hind, calf Fox Trophy: Red deer, Sika deer, Mouflon deer - according to the price list Expected hunting bag: 1 animal per hunter per day. The final hunting bag comes with dusk, after hunters leave for their accommodation. Additional hunting day can be added for 367.-€/hunter including organization of hunting, driver, beaters and dogs, transport in hunting area, interpreter, accommodation and service). Hunting price for additional hunting is not included. 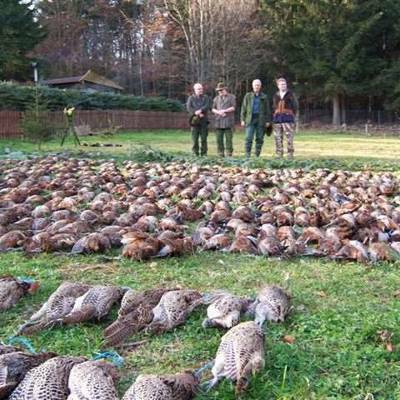 For hunting in Czech Republic is needed : Czech hunting licence, Insurance, Hunting Invitation. That is the reason why we need to send with your booking list copies of following documents: Hunting licence from your country, and passport or personal paper. The next step is to fill the booking list with your name, date of birth, passport number or personal number. When we have all necessary documents, our firm submit a Czech hunting licence for you. Please inquire for available days. 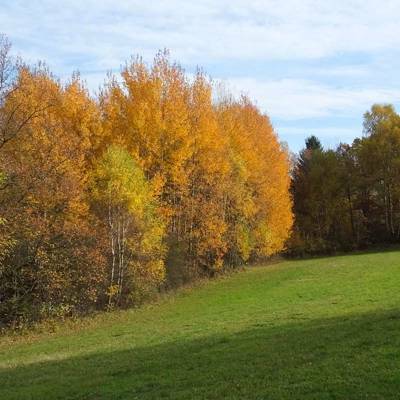 We offer 5 days/3 hunting days (1 arrival and 1 departure days) driven hunt with trophy in the bohemian forests at the altitude ca.400-800 m. Wildlife that is available to bag: Wild boar - tusker, pig, piglet, sow - closed season Red deer - Red deer until 8 endpointer, hind, calf Mouflon - Mouflon until 150 CIC, ewe, lamb Sika deer - until 180 CIC, hind, calf Fox Trophies which are not included in the package are according to the valid price list. Expected hunting bag: 1 animal per hunter per day. The final hunting bag comes with dusk, after hunters leave for their accommodation. 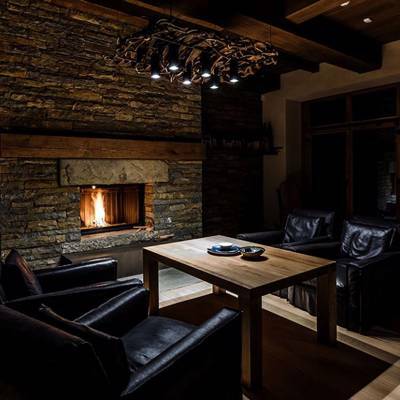 Additional hunting day can be added for 472.-€/hunter/ day including accommodation with full board, hunting guide, transportation in the hunting area, beaters and dogs. Hunting price for additional hunting is not included. 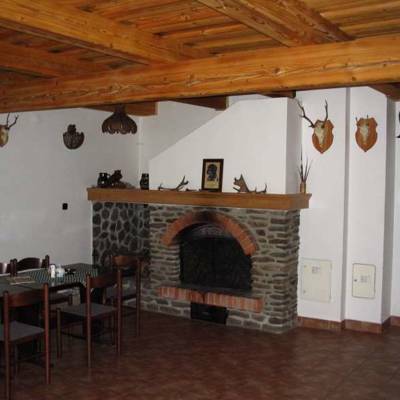 For hunting in Czech Republic is needed : Czech hunting licence, Insurance, Hunting Invitation. That is the reason why we need to send with your booking list copies of following documents: Hunting licence from your country, and passport or personal paper. The next step is to fill the booking list with your name, date of birth, passport number or personal number. When we have all necessary documents, our firm submit a Czech hunting licence for you. Please inquire for available days. You will be hunting in the White Carpathians protected landscape area with a magnificent view of the White Carpathian meadows. The Central European Red Deer ( Cervus elaphus hippelaphus) is light ginger in colour in summer, though darker in the winter. It has a good quality mane and a light rump patch. The length of the male body is 2-2.2m and the tail is 0.15m long. Its skull is 400-420mm long and 165-180mm wide. The weight of the antlers is 6-10kg. 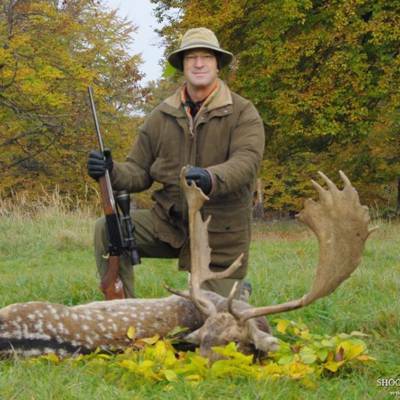 Fallow deer in Czech & Slovakia are widespread, present in big numbers with high quality trophies. Hunters should expect to bag fallow stag with over 220 CIC score. Wild boar can be stalked on foot, shot from high seats or driven towards waiting guns. 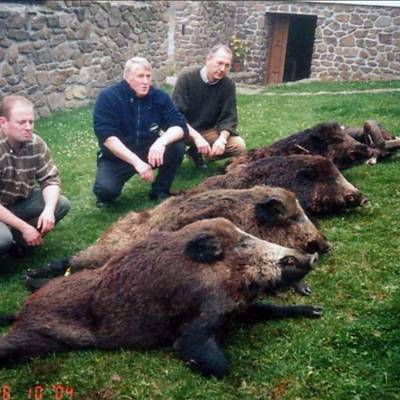 We offer flat rate Wild boar hunt in Southern part of Czech Republic. 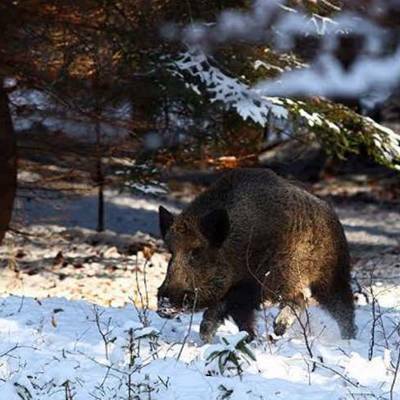 The package offer includes one Wild boar shooting without size limitation, 5 days/10 stalking, hunting organization, insurance, hunting invitation and hunting licence. Accommodation for 5 days is €380 per hunter. Trophy will be marked 24 hours after preparation. It is possible to provide driven hunt in a small group, if the snow is on the land and we can see wild boar´s trail in and located their position. Hunting time: whole year Best hunting time: always about a week before the full moon Rutting season: Nov 1. - Jan 31. Additional hunting days can be added for €175 per day including accommodation with full board, hunting guide, transfer in the territory. 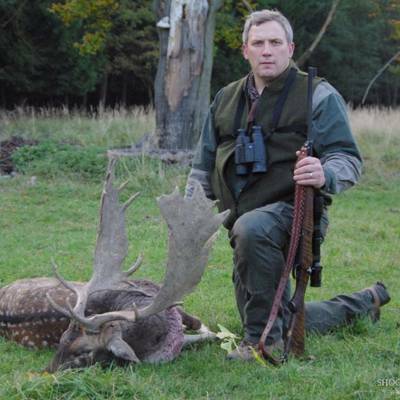 For hunting in Czech Republic is needed : Czech hunting licence, Insurance, Hunting Invitation. That is the reason why we need to send with your booking list copies of following documents: Hunting licence from your country, and passport or personal paper. The next step is to fill the booking list with your name, date of birth, passport number or personal number. When we have all necessary documents, our firm submit a Czech hunting licence for you. Please inquire for available days.